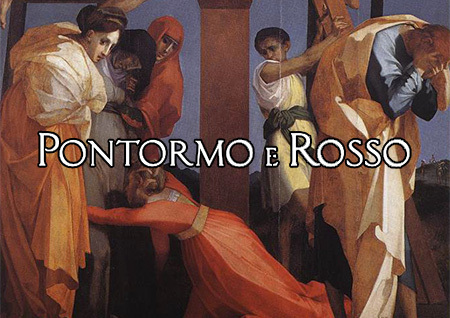 The magnificent altarpiece by Rosso Fiorentino on display at Palazzo Strozzi summarizes the meaning and sense of the exhibition: in spite of the celebrity and notoriety of the works it offers multiple layers of enjoyment and interpretation for the scholar and for the art lover alike. The first important choice for the curators of the exhibit was to avoid as much as possible the word “mannerism”, discarding a reassuring label and to keeping the focus on the artworks and the personalities of the artists, permitting the works themselves to communicate without preconceived conditions or imposed structure. 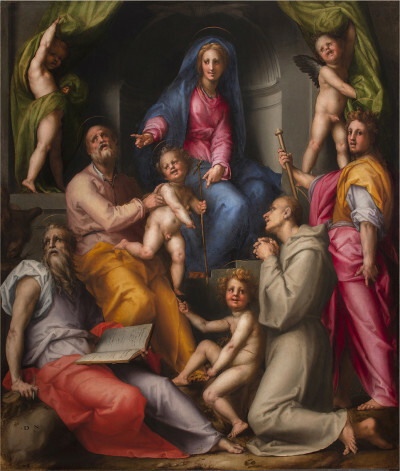 Immediately upon entering the first room of the exhibit we are faced with three different styles and languages: the older Andrea del Sarto, master in blending different influences and frequently described as eclectic; Pontormo trying to fuse grandiosity in composition and naturalism in detail; and Rosso holding on to the purity, both spiritual and artistic, of the early Renaissance. Even while they knew each other and saw each other frequently their artistic destiny diverged early on: Pontormo spent his life in Florence, concentrating on elaborate compositions like the wonderfully restored Pala Pucci. Rosso, ambitious and unfortunate at first, traveled from one city to another pursuing his rougher and more rigid vision. The thematic sections devoted to drawings and portrait further underline their differences: Pontormo more intimate and sensitive to emotions, displaying a more modern sensibility, and Rosso more abstract and archaic. Rosso’s portraits are modelled on Castiglione’s Cortegiano, the ideal Renaissance gentleman, and are technically archaically refined. This is a unique occasion to admire in one place all but one of his most noted and attributed portraits. Another important detail is the limited time period covered by the works, barely 30 years, but full of events that changed religion politics and culture, from the Reformation to the sack of Rome, and Pontormo and Rosso reflect this turmoil in their creations. Rosso more inclined to (black) magic and rituals, and Pontormo seduced by German art, especially Durer (and possibly by heretical ideas). The final sections of the exhibit produce a cinematographic-like plot twist. After his peregrinations Rosso became court painter for Francis I King of France. His cultivated style, his good knowledge of Michelangelo and his Florentine origins became a pass to success and led to the internationalization of the concept of Renaissance. 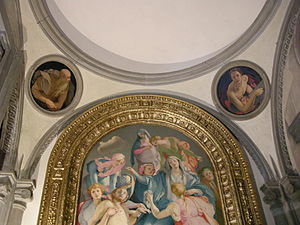 On the contrary Pontormo’s works after 1540, thanks in part to an jealous and ungenerous Vasari, have been either destroyed or lost, leaving us to conjecture, at least up to the present. The Palazzo Strozzi website offers information on timetables and events related to the exhibition. A Florentine itinerary on Pontormo and Rosso, including the exhibition and the Deposition of Pontormo in Santa Felicita (and more) can be arranged in a tour, just contact us with your request, and remember that holders of an Uffizi ticket get a special 5€ ticket for the exhibition.